I am not a particularly cautious parent. My kids ride their bikes to school, take the train into Boston with friends, fly alone to visit relatives. My son plays football and rapels down trees, both girls went to sleep- away camp at age 7, and I left each consecutive child home alone at an earlier age. (If we had a fourth, he’d be home changing his own diaper while I shlepped the other kids to music and sports.) I hesitate to admit this, for fear of tempting fate, but my first instinct is always to assume that everything will be fine. If a child doesn’t arrive home at the appointed hour or the phone rings in the middle of the night, I never go straight to panic; I am much more inclined to believe there’s a perfectly good and innocuous explanation. Of course, my willingness to accept risk depends on the child. (Anyone who insists they treat each of their children “exactly the same” must have only one child.) With my cautious first-born, now 16, I remember standing on top of the driveway screaming, “TAKE YOUR FOOT OFF THE BRAKE! !” as she learned to ride a bike. (With her baby sister, the yelling tends more toward: “Slow down! Not so high! Get off the roof!”) I have also counseled my oldest to consider simply holding a beer at a party where there’s underage drinking, just to avoid calling attention to her straight-laced ways–advice I would never in a million years give her boundary-pushing younger brother. In my experience, kids are actually pretty good at judging risk for themselves. One day this past winter, my son sat with his legs dangling out the open window of his second floor bedroom. He was eying the four-foot layer of snow covering the stone patio below and debating whether or not he should jump. I could see the appeal, and I was fairly confident he’d be fine, but I could also imagine the emergency-room doctor asking me: “Where were you when he jumped?” And I’d have to say, “Watching from below.” So I said, equivocally, “You might be fine but I wouldn’t risk it. The snow’s pretty hard.” He dithered for awhile, sitting in the window frame and weighing his options. Then he said abruptly, “I’m not going to get hurt.” I believed him, and ran to grab the camera. He was right. Sara rappelling down the Lhotse face (photo by guide Dave Hahn). 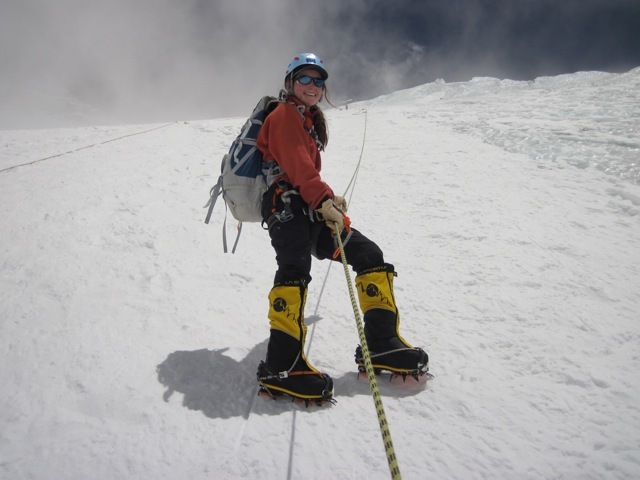 Sara and her dad, Bill, are experienced mountain climbers with plans to summit the highest peak on every continent. 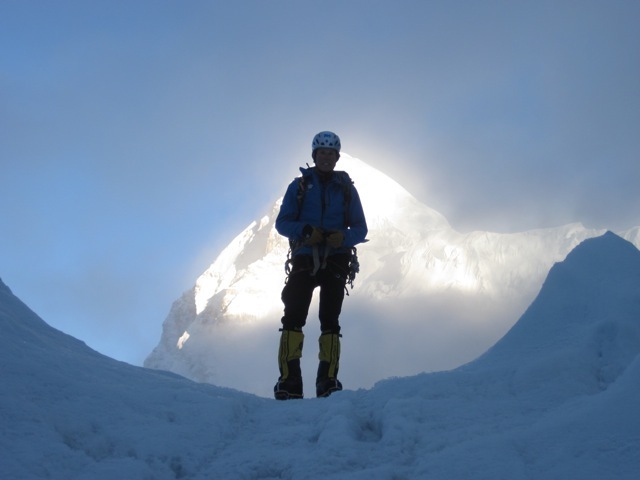 They started out from Nepal at the end of March, accompanied by two extremely practiced guides and several sherpas. They made excellent progress and were feeling strong and healthy at base camp, where they ate Lucky Charms and played horseshoes. But once they got up above 23,000 feet, Bill started struggling with insomnia and shortness of breath; on May 4 he made the decision to halt his climb. Sara, who worked on several Everest-related independent projects to compensate for the school she was missing, continued on with the guides. The conditions were brutal, and though exhausted, she climbed with strength and confidence. Still, she missed her dad, who was waiting back at base camp. Earlier this week, Sara decided she’d hit her limit and abandoned her summit bid. For her extremely eloquent explanation of that decision (and a riveting, insightful account of their adventure), check out the RMI Expeditions blog. I know Lisa is thrilled and relieved that they’re heading home. And while Sara is no doubt destined for a hero’s welcome, I think Lisa is the real hero for trusting her daughter enough to let her take such a monumental risk. I’m not sure I could have done it. But next time we have a blizzard, I’m going to encourage my son to try jumping from the roof. This entry was posted in Family life, Kids, Parenting, Teenagers and tagged Mt. Everest, risky behavior, teen mountain climber. Bookmark the permalink.